When one thinks of the Jurassic Period, the first things that come to mind are the dinosaurs; Tyrannosaurus Rex, Velociraptor, Brachiosaurus and Triceratops. Those enormous and unforgettable images of Earth’s past masters have been made so real to us today by Steven Spielberg’s “Jurassic Park” and many other movies, television shows and works of art. But even as the dinosaurs ruled the land, another branch of their family was evolving to rule the skies – a small raven-sized, feathered animal that we have named Archaeopteryx. There may have been other proto-birds before Archaeopteryx and there are questions as to whether it was capable of true flight, which would require the ability to raise its wings above its body in order to achieve the lift necessary for taking off from the ground. Physiological studies of the fossils found differ in respect to this ability, but it was certainly capable of gliding for long distances, and more than likely lived in trees and shrubs. The name Archaeopteryx comes from the Greek words for “ancient,” and “wing or feather”. The bird existed 150 million years ago, during a time that scholars have placed in the late Jurassic Period. In that period, Europe was part of an archipelago of islands, in a relatively warm and shallow sea, located much closer to the equator than it is today. The first Archaeopteryx fossil was just a feather, found in 1860 or 61 in the limestone deposits near Solnhofen, Germany by the German paleontologist, Hermann von Meyer, who named and described its classification just two years after Charles Darwin published “On the Origin of Species”. The first skeletal fossil, missing most of its head and neck and unearthed in 1861, is known as the London Specimen. It belonged to a German physician, Karl Haberlain, who probably received it in exchange for medical services. He sold it to the British Museum, where it resides today, for 700 pounds. Perhaps what is most impressive about this specimen is the feathers and relative bird-like quality. Some experts argue that it was more dinosaur than bird, due to its dinosaur characteristics, namely the bony tail, razor sharp teeth and claws placed high upon the wings. Anti-evolutionists, however, claim that it is in fact a bird, but a very odd bird. These features suggest that Archaeopteryx is a perfect choice as a transitional animal existing between birds and dinosaurs and for studying avian origins. 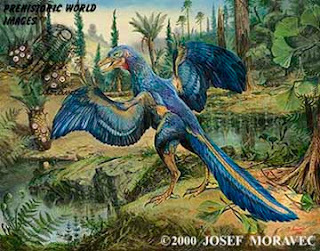 An exceptional portrayal of this find can be found in Josef Moravec’s painting of Archaeopteryx lithographica, shown at the top of this article. Josef Moravec is a renowned paleo artist whose paintings reflect his quest to realistically portray eras of Earth’s past. The obsession, for him, was attributed to a form of escapism into an alternate world, one replete with scientifically accurate ancient landscapes of natural beauty and the creatures who once inhabited our planet. By appreciating and studying the techniques of greats like Rembrandt and Leonardo da Vinci, Moravec formed a niche appropriate for his passion. Regarding paleontology, Moravec has borrowed the light from Czech paleoartist, Zdenek Burian, a proponent who showed the prehistoric world for all that it truly was. Moravec’s brilliant portrayal of the Archaeopteryx in a beautifully rendered painting would not have been so exceptional if not for his immense interest in and knowledge of the prehistoric world.